Hungarian physician, and writer on medical topics; born at Nádas, Hungary, April 2, 1832. 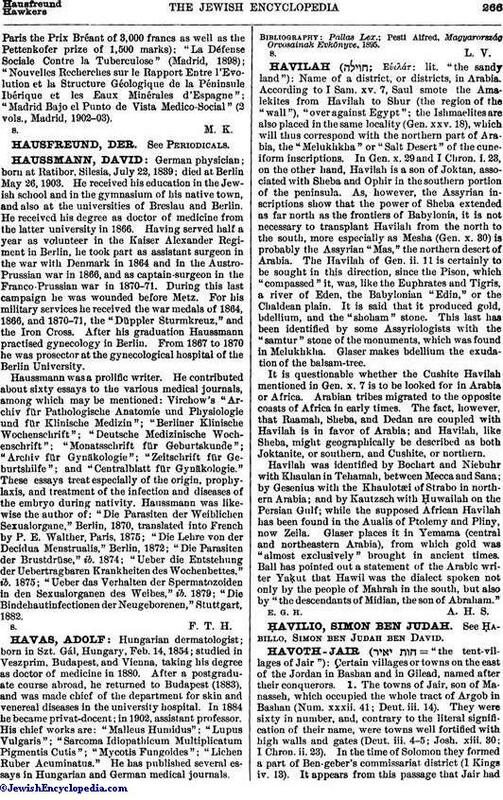 For several years he attended the Talmudic school at Presburg and that at Nikolsburg, Moravia (1848). In 1852 he began the study of medicine, attending successively the universities of Vienna, Paris, and Bern (M.D. 1858). On the completion of his studies he went as physician to Tangier, where more than 4,000 Jews were living. When the war between Spain and Morocco broke out a year later, Hauser, with many of his coreligionists in Tangier and the coast district, sought refuge at Gibraltar, where he took charge of the provisional hospital established by the Jewish community. After the Spanish had taken Tetuan (Feb., 1860), Hauser went to that city, where the cholera was then raging, in order to relieve the Jews there; a year later he returned to Gibraltar and resumed his practise. He was frequently called for consultations to the interior of Morocco, and to Cadiz and other Spanish cities. In 1872 he settled at Seville; there he succeeded, in spite of many difficulties, in compelling recognition, and was appointed by the municipal council as delegate to the fourth international hygienic congress. 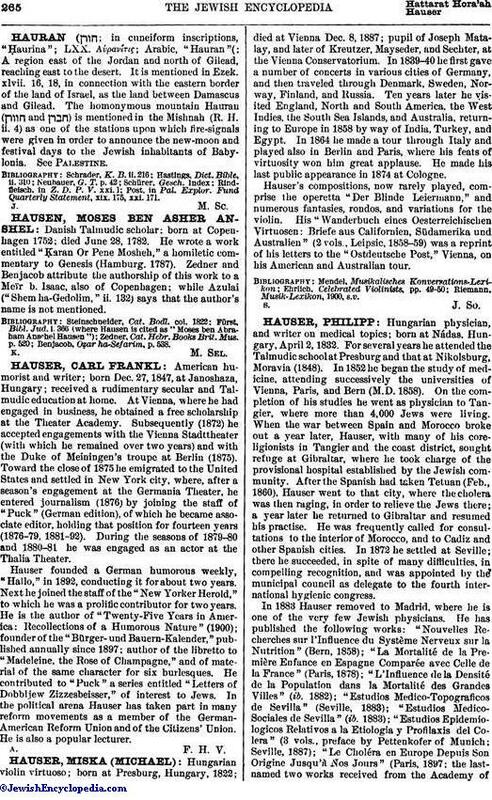 In 1883 Hauser removed to Madrid, where he is one of the very few Jewish physicians. He has published the following works: "Nouvelles Recherches sur l'Influence du Système Nerveux sur la Nutrition" (Bern, 1858); "La Mortalité de la Première Enfance en Espagne Comparée avec Celle de la France" (Paris, 1878); "L'Influence de la Densité de la Population dans la Mortalité des Grandes Villes" (ib. 1882); "Estudios Medico-Topograficos de Sevilla" (Seville, 1883); "Estudios Medico-Sociales de Sevilla" (ib. 1883); "Estudios Epidemiologicos Relativos a la Etiologia y Profilaxis del Colera" (3 vols., preface by Pettenkofer of Munich: Seville, 1887); "Le Choléra en Europe Depuis Son Origine Jusqu'à Nos Jours" (Paris, 1897; the last-named two works received from the Academy ofParis the Prix Bréant of 3,000 francs as well as the Pettenkofer prize of 1,500 marks); "La Défense Sociale Contre la Tuberculose" (Madrid, 1898); "Nouvelles Recherches sur le Rapport Entre l'Evolution et la Structure Géologique de la Péninsule Ibérique et les Eaux Minérales d'Espagne"; "Madrid Bajo el Punto de Vista Medico-Social" (2 vols., Madrid, 1902-03).